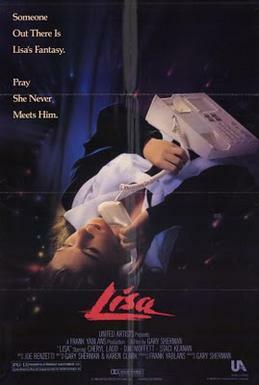 I recently watched Lisa, a horror/thriller hybrid from 1990. Now, there are a number of possible reasons. It is October, which means that I’m going to be spending this entire month watching and reviewing horror movies. And there’s the fact that I have a weakness for horror films from the late 80s and the early 90s. On top of that, Lisa was directed by Gary Sherman. Gary may not be a household name but he’s directed some of the best exploitation films around. Among his credits: Death Line, Dead and Buried, and Vice Squad. Those, of course, are all good reasons but to be honest, the main reason I watched Lisa is because the movie is about a girl named Lisa and I am a girl named Lisa, so why not? Anyway, Staci Keenan plays the title character. Lisa Holland is 14 years-old and the daughter of a florist named Katherine (Cheryl Ladd). Lisa and Katharine have a close relationship, despite the fact that Katharine is extremely overprotective. Katharine was only 14 when she had Lisa and she fears that her daughter will end up the same situation that she did. As a result, she’s forbidden Lisa from dating until she’s 16! So, while all of Lisa’s friends are going out on dates and having fun, Lisa is stuck at home with her mom. Then, one night, Lisa happens to spot Richard (D.W. Moffett) walking down the street. Richard is handsome, suave, and charming. He owns a restaurant and spends most of his time hanging out with the rich and beautiful. Lisa and her friend Wendy (Tanya Fenmore) start to follow Richard around town. They even manage to get his phone number and soon, Lisa is calling him in the middle of the night. Wendy suggests that maybe it would be a good idea for Lisa to set Richard up with her mom. Maybe if Katharine falls in love, she’ll stop being so strict with Lisa. It sound like a good plan, except for the fact that Richard has a second job. In his other line of work, he’s known as the Candlelight Killer and he murders rich and single women in Venice Beach. And though Lisa doesn’t know it yet, she’s just set up her mother to potentially be his next victim…. Lisa is a fairly predicable film and, given its subject matter, a rather tame one at that. It’s the type of film that, if it were made today, it would probably air on the Lifetime channel. That’s okay, though. I like Lifetime films! Staci Keenan, D.W. Moffitt, and Cheryl Ladd all give good performances and I especially liked the way that the film handled the loving-but-fraught relationship between Lisa and her mom. (Even if she hadn’t been named after me, I still would have related to Lisa.) Their relationship felt real and it added some stakes to what could have otherwise been a fairly routine thriller. Lisa is an effective and efficient film of modest ambition, one that you’ll enjoy but probably forget about an hour after you watch it.